Samsung has recently announced the worl’d first Terabyte class mSATA SSD, offering storage capacity of up to 1TB – the Samsung 840 Evo mSATA SSD. Just like its standard SSD brother, it also offers a wide range of storage capacity from 120GB up to 1TB and offers the same level of high performance and high density, only in a smaller form factor about 1/4 of the size of the standard 2.5-inch SSD. mSATA Solid State Drives are becoming more and more popular these days. Usually it’s the Ultrabooks or Notebooks and All in One PC’s who are the primary users of mSATA SSDs. 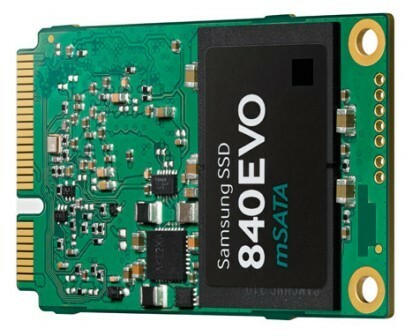 The Samsung 840 Evo mSATA uses a Samsung 128Gb NAND flash memory based on 10 nanometer class process technology. In the 1TB capacity, there are four flash memory packages used, each containing 16 layers of those 128Gb chips. The 1TB mSATA is capable of 98,000 random read and 90,000 random write Input Output Operations per Second. Its sequential read speed is around 540MB/s, and its sequential write speed is around 520 MB/s. These speeds may not be the actual speeds you get in real life, but it’s close to those figures. Let’s just wait for review samples to see its actual read and write speeds, and real life benchmarks. With regards to its physical aspects, Samsung’s Evo mSATA is only 3.85 mm thin, with a weight of 8.5 grams. 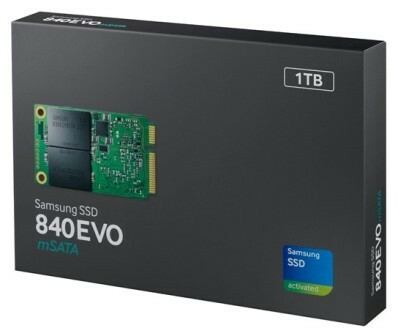 According to the company, the new Samsung 840 Evo mSATA SSD can be used together with an existing SSD or HDD, as long as there is an mSATA socket on the laptop, notebook or mobile device. There is also a software included in the product called the Samsung Magician 4.3 that allows the maximum of over 1,000 MB/s sequential read speed on Real-time Accelerated Processing of I/O Data mode. This results in a performance gain of twice of a typical SSD and 10x of an average HDD. This sounds like an overclocking utility. The Samsung 840 Evo mSATA SSD also features 256-bit AES key encryption, just like in the standard Samsung 840 Evo and Evo Pro SSDs. You can also migrate your data using Samsung Data Migration or the Samsung Magician 4.3 which are compatible with Windows 8. The Samsung 840 Evo mSATA is expected to be released starting this December 2013. I’ll post update once it becomes available to order on popular online stores. Meanwhile, with regards to its pricing, Samsung has not disclosed its manufacturer’s suggested retail price. But we are expecting that these will be priced higher (or a tad higher) compared to the standard Samsung 840 Evo SSD.